Miguel Mateos was born in Mexico City and from a young age of seven Miguel was cooking with his "Tia Christina" (Aunt Christina) whom taught cooking classes at the local High School. Some of Miguel's early experiences with food are from the town of Jalapa in the state of Veracruz. 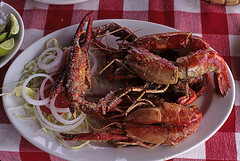 Veracruz is famous for its abundant seafood; he learned how to prepare his favorite Dishes: Langoustines with a Chipotle sauce and Chilpachole de Jaiba (Crab soup with several different chilies - this soup is famous in Mexico to eat when you are hung-over.) 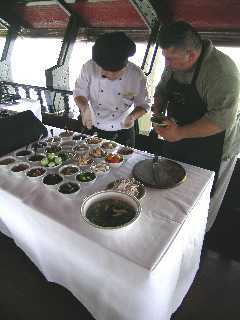 He also discovered one of his favorite Mexican Herbs "Acuyo" which has a unique anise favor. Miguel worked several years for Club Med stationed in different resorts in Mexico and the Caribbean Islands, at the Club Med on Paradise Island Bahamas and Turks and Caicos he learned from local chefs the "Bahamian" style of cooking fresh fish and seafood. Chef David from St. Lucia, who taught him how to cook all types of fish, even fish Miguel had previously thought as undesirable for cooking. Pauli from Turks and Caicos (West British Indies) taught Miguel how to prepare Bone Fish with Black beans and Rice. Floyd and Solomon local fishermen from Nassau in the Bahamas taught him the many ways to cook Conch. After moving to the states, Miguel attended Oakland University in Michigan where he studied Culinary Arts. In 1998 Miguel and his wife Liza left Metro Detroit to move to their present home in Playa del Secreto, Mexico, where they own Luxury beach front villas that they rent. 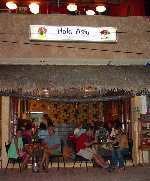 Miguel and his wife opened Hola Asia Restaurant in 2000, located in the fishing town of Puerto Morelos, Mexico offering an eclectic mix of Asian cuisines using fresh fish and seafood caught locally. The restaurant closed a few yaers ago and now Miguel is the private chef to visitors to their villas in Playa del Secreto, many of whom he has taught Mayan cooking to. Last April, Miguel and Liza spent a month in Southeast Asia taking cooking classes in Thailand, Vietnam and Taiwan, learning to cook some new items for the Hola Asia menu. They really enjoyed the cooking classes, and felt that through the classes; not only did they learn to cook new dishes, but met some great chefs and experienced much more of the local culture than if they had gone on a regular vacation. They knew from starting a restaurant in Mexico how Food Bonds People, how people of vastly different backgrounds and cultures open up when talking about their favorite Foods. On returning to Mexico Chef Miguel thought that he would offer Cooking Classes to visitors of the Mayan Riviera what he has offered visitors of his villas in the past, so they too could experience "Sazon y Sentimiento" (Taste and Feeling) of Mexico.